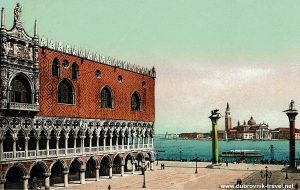 Visiting Venice as well as Dubrovnik is a journey that many travellers take and I often receive emails asking me about options for travelling between these two cities. Many ask about direct ferry lines. Unfortunately, there is no direct ferry connection between Venice and Dubrovnik – it used to be one, but it is discontinued years ago. However, there are still several other options of travelling on this route using either planes, ferries, trains or/and buses. The easiest and most comfortable and efficient way of travelling from Venice to Dubrovnik is to fly to Dubrovnik Airport. There are currently two air companies that operate these flights – Croatia Airlines and Volotea (see above flight route example). Flight duration is about 1 hour and 20 minutes. Direct flights are operating May to September only while one stopover is available all year around. From Split take bus or ferry to Dubrovnik. From Pula take a bus to Rijeka and further along Croatian coast all the way to Dubrovnik. Trieste to Dubrovnik is a very very long journey, it lasts all day around (24 hrs and more). I did it only once and never more 😉 Although the buses are very comfortable and air-conditioned the journey is very hard and takes far to long. It is much better to go via Ancona or Bari indeed using trains and ferries. My travel tip: bear in mind while choosing your journey that is much more comfortable to take a train along Italy to its Adriatic coast than bus along Croatian coast as buses are much slower and less comfortable than trains. See also all Venice ferries info and schedules.